Hello! Wow I have so much stuff to review and so little time, I have been a very busy girl lately with personal issues and University issues so I really do apologise. I always get extremely excited when my Joliebox comes through the post, as you will all know I am now a Joliebox convert, not only is it French and beaaautiful, the service is impeccable and the products inside are incredible, as the French would say, it really is 'parfait'. Perfect, for those non-french speakers. Okay, so lets get to business, when opening the October menu (yes they give you a cute little card called a menu which tells you what's in your box - it's little touches like this that make me love Joliebox!). I was very excited to see that this is a 'Pure and Natural box' which according to Jolie, will be your 'beauty survival kit' throughout autumn. So what did I get? Okay, so the products. This probably isn't a good photo, so I will talk you through them. 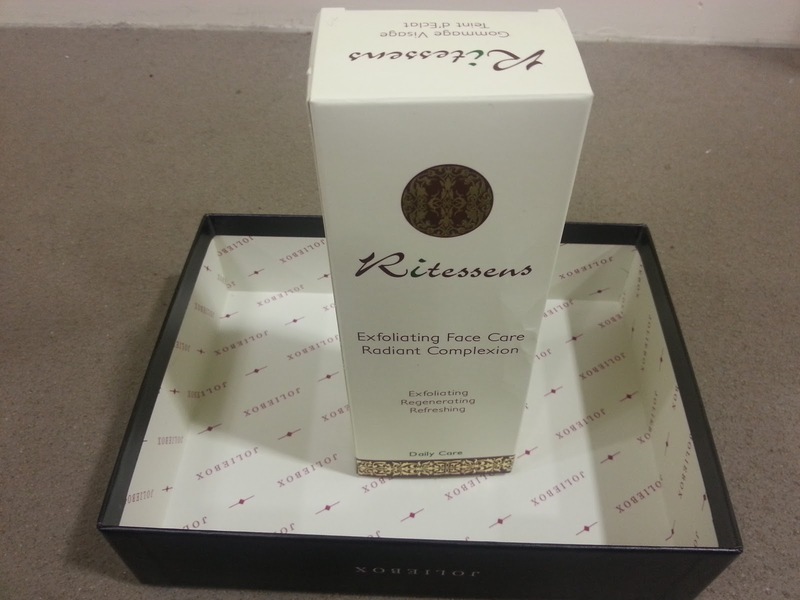 RITESSENS EXFOLIANT REVIEW - I am so happy that I got this, I've really been into my skin care at the moment, but my Dermalogica cleanser ran out and to be honest, I can't afford a new one. This seems like the perfect cleanser to move onto, it uses a powerful blend of natural plant extracts AND Moroccan argan oil; in order to give your skin a well deserved boost. I think this is my fave product, ever. I've used it every day since receiving it and my skin does feel a lot brighter, even though I've been out nearly every night and (oops I'm sorry...) fell asleep with my make up on one night. I can't find a price anywhere for this product but I assume it's quite expensive. I can't believe we got a full size in the box, well worth the money. 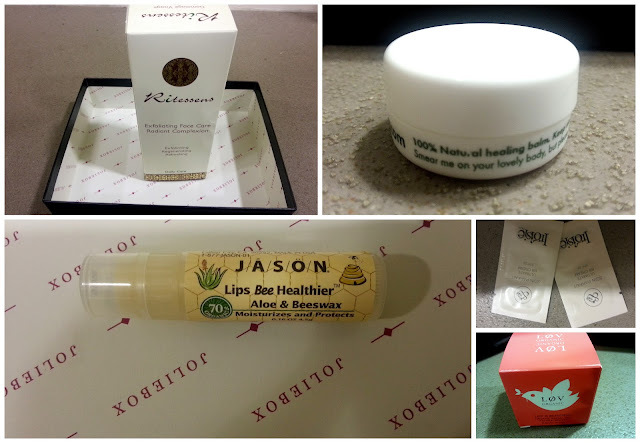 -JASON - BEE HEALTHIER LIP BALM STICK - A naturally nourishing hand-bag ready lip balm. Aaah I love this, it came at the right time as my lips really were sore. The ingredients of this are really natural. -MOA - THE GREEN BALM - I have to admit that I haven't used this product yet, but it is an intense, multi-purpose balm that gives moisture to chapped and dehydrated skin. I will probably use this on my hands when the weather gets colder. The packaging is really cute though. -IROISIE - SOIN PARFAIT ULTIMATE BB CREAM - I wish the sachets of this were just a tiny bit bigger so that I could really trial this out for a few weeks, so far so good though, it has SPF25 so no chance of any sun getting onto your skin and harming it. It includes natural pigments which blend into the skin, this gives you a flawless and build-able coverage. I will let you know how I get on with this! -LOV ORGANIC - LOV IS BEAUTIFUL (lifestyle product) tea bags. This is an organic herbal blend of white and green tea that is packed with antioxidants and zinc which have proven skincare benefits. How interesting When I first saw this I was a bit like, ahh why is there tea in my beauty box, but I get it now, it is good for the skin. In the words of Dr Murad 'eat your water' and I suppose this counts. I also love that on the menu they say, 'we've included [the tea] for a thoroughly cleansed mind, body and soul' awweee. Nice finishing touch. I think it'd make a lovely present as it's packaging is so cute. 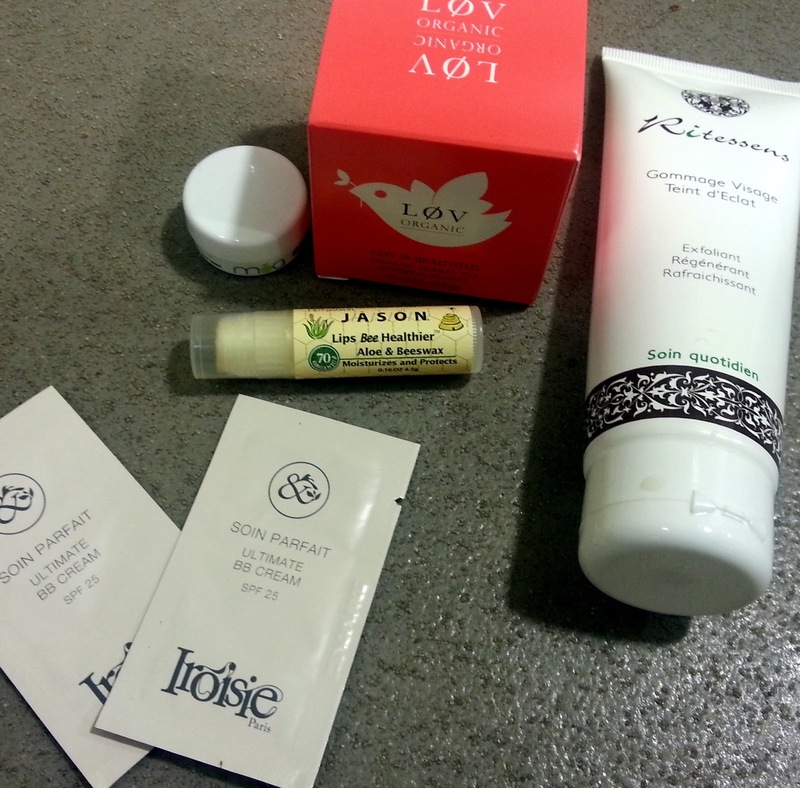 All in all I am very impressed, particularly with the Riessens exfoliator, my new pride and joy. I really can feel the difference. I've said before that I'm not someone who goes crazy for organic and natural products, but they really are so much better for you than perfumed, damaging products, so I'm really thankful that Joliebox did this pure and natural box - just in time for Christmas. It really gave me the chance to find some new products that i'd never have even thought about before. Mwah, thanks Jolie. I've come to discover that I really don't like the surprise of boxes like these (I had a subscription to glossybox but I cancelled because I never got anything I liked) lol. Looks like you got some pretty good stuff this month, though! I always loved getting these boxes but got a bit bored of them with having so many samples everywhere! I did love receiving it though, it's like having a present in the post every month! The exfoliant looks good though! I've followed you on fb, GFC, twitter and instagram. Would love it if you checked out my blog, and if you like it maybe follow back? I write a blog about natural cosmetics and I love it when I see natural products featured! Sounds like a great box, especially with the exfoliator :) Lots of lovely products to try! Such a great interesting post! <a href=" www.earthsapothecary.com”>natural products </a> is sustainable lifestyle brand so thanks for sharing your experience.